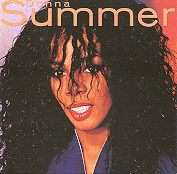 "There's been a change inside my life..."
Love it or hate it, this month's Summer Fever pick is a pivotal album in Donna's career. It effectively ended one era and began another. And because of that, this album (and the one it replaced) is usually the subject of "what if" discussions among fans. 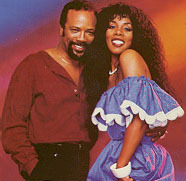 Donna Summer enjoyed some chart success, spawning hits like Love Is In Control and State Of Independence, and a few of the songs tend to show up in fans' lists of favorite tracks very frequently. Lush Life, Love Is Just A Breath Away , Protection, and the sadly difficult to find Sometimes Like Butterflies are the ones most frequently cited. Yet many fans still hold some animosity towards the album. And I think while some of that may just be a case of some fans not liking the Quincy Jones sound, I think most of that has more to do with the circumstances of its release. The shelving of Rainbow effectively ended the long-standing collaboration of Donna, Giorgio Moroder and Pete Bellotte. That was a bitter pill for some fans to swallow. Added to that was the fact that Donna was not nearly as successful in the 80s as she was in the 70s, and many fans feel that things would have been different if Rainbow had come out instead. from a poor quality video so excuse the fuzziness. I think the new album is a, what do you call it, a collaboration and a wonderful mix of a lot of people's talents. And certainly Quincy Jones's expertise and, - I mean, I love that man. And at a time when I was pregnant and feeling very insecure perhaps, and very nonmusical, very unproductive, I mean just pregnant. When you have to be professional, and musical, and be creative, and you just want to - all you want to create are baby clothes. You know, you want to paint the room, and you want to do this and you don't really want to get into music. It can be very hard. And I find that, - I found that Quincy was a disciplinarian in a time when he really needed to be for me. And I think that really helped me to get through the album. And thank god for that. In a way, it's really a people's record. So many talented people put so much into making it, that it really belongs to all of us. Of course I had to like everything on the album, but it was Quincy that really searched out the tunes and he worked really hard to find the right ones. 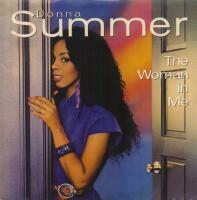 The first collaboration between Donna Summer and Quincy Jones sounds as tantalizing on vinyl as it does in theory, taking full advantage of Summer's existing credentials in fusing pop, rock and dance while expanding her powers as an r&b stylist. 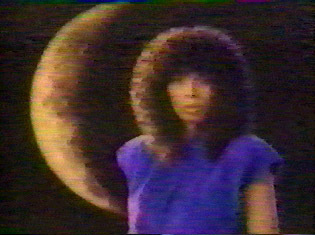 As signaled by the first single hit from the package, "Love Is In Control", Jones has extracted added nuance from Summer's powerful voice, enabling her to display greater control or less inhibition as the material dictates. The producer's usual session crew affords his widescreen sonic stamp, but an all-star supporting cast and an array of solid songs bring added appeal. With modern r&b, romantic pop ("Mystery of Love"), bracing rock (Bruce Springsteen's "Protection," with the Boss on guitar), and even classic torch singing ("Lush Life") all represented, expect multi-format sales and airplay. 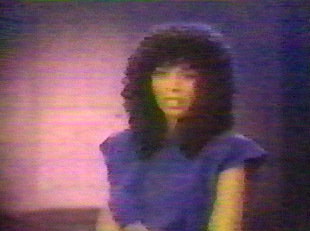 BONUS AUDIO CLIP: Donna talking about Love Is In Control on Hollywood Live in September, 1982. I sing it to my husband. And it's like every woman wants a man that she's with not just to know what he knows about her. Cause it's obvious what you know about a person. You know what you want, you know what you don't want basically. But there's a lot of things that you want each other to know that are much deeper and much further inside, and that people just tend to constantly overlook, you know. It's a very deep song to me. It's a song that really expresses what I've been feeling lately. It's got an optimism and a sense of purpose that's based in reality. Oh, I love that song. It's just, it just says so much and that's you know - I think it's a great song. I really - I'm glad that I did it. A lot of people have come to me and said "Boy that song is really heavy. It really made me stop to think." And that's what I want to do. BONUS AUDIO CLIP: Donna talking about State Of Independence on Hollywood Live in September, 1982. Livin' In America is just about my favorite cut. It's really how I feel about this country: the land of the free, one nation under God indivisible. It may sound corny, but to me it's about believing and being positive about what you believe. BONUS AUDIO CLIP: Donna talking about Livin' In America on Hollywood Live in September, 1982. When Bruce [Springsteen] brought me the song originally we tried doing it as a duo. It was a great idea, but it really didn't work out. The tune just wasn't written that way and eventually I did it myself. But, it's funny... I heard him do it so much in the studio, that to me, I sound just like him on the track. Well, we did [Protection] originally as a duet. I still have this duet. I got your duet! [laughs] Anyway, we sang it, and he had written it as a single, you know for a single person. And it didn't sound right with him singing it as a duet with me. I mean, his voice sounded great, but the words sounded illogical. And he would have had to sit down and rewrite the whole song. And he really didn't have time because he was working with Gary US Bonds, and he was producing his album. He was really just jumping in as a favor. So, you know, they took his voice off it, just [to] make sense. And he continued to play on it, and even if you listen to the end of the album, he is saying a few things. "She could really sing and I disliked the veiled racism of the anti-disco movement." 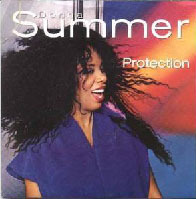 BONUS AUDIO CLIP: Donna talking about Protection on Hollywood Live in September, 1982. It was the hardest song I've ever sung. Quincy insisted I do it and I'm glad he did. BONUS CLIP: Sometimes Like Butterflies (B. Roberts/ D. Summer) This song was never on the album, but it was the b-side to the first single, Love Is In Control. Because of that it is very hard to find, but it is definitely worth the search. BONUS CLIP: Protection: what could have been. 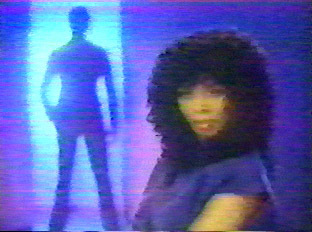 While the original duet version remains locked in Donna's vault, fan mixer Summer2k was able to take Donna's solo version and combine it with Bruce Springsteen's bootleg version to create a computer generated duet version. If you run into a duet version on the web, this fan mix is what you have found. The original duet has never escaped the vault. Videos were made for Love Is In Control, The Woman In Me, and State Of Independence. Of the three, only State of Independence appears on the Endless Summer video compilation. The other two can occasionally be found online on other fan sites or on music sites. Originally Bruce Springsteen was going to give Donna a song called Cover Me. His manager convinced him to keep it, and it became one of the hit singles off his biggest album, Born In The USA. Right after producing Donna Summer, Quincy Jones went into the studio with Michael Jackson to produce one of the (if not the) best selling albums of all time - Thriller. Donna sang Livin' In America at Ronald Reagan's inauguration. The Woman In Me includes a spoken intro on the album that was not used on the single edit. State Of Independence with its all star choir is kind of a precursor to Quincy Jones' later involvement with the 1985 benefit song, We Are The World. In 2014, the Geffen albums were remastered and reissued in CD and vinyl format , and as individual releases as well as in a box set. These reissues were deluxe releases with all the original art, some new liner notes, and some bonus tracks. 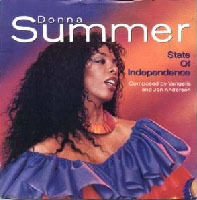 The Donna Summer release added Sometimes Like Butterflies, the 7" version of Love Is In Control, a dance remix of Love Is In Control, an instrumental of Love Is In Control, the 7" version of State Of Independence, the N.R.G. mix of State Of Independence, and the New Radio Millennium Mix of State Of Independence. 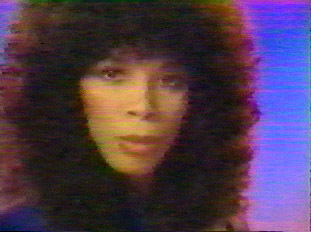 Donna Summer was reissued in 2014 as a remastered deluxe edition. It can be found at Amazon (as an import) and Amazon UK, and other vendors as a CD, a vinyl record, and of course as downloadable music. The original release is out of print.